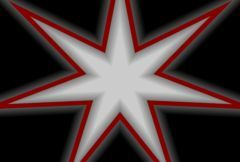 Performs a wipe transition between two input clips using a star shape. The Wipe Amount parameter should be animated to control the transition speed. Increase the Border Width parameter to draw a border at the wipe transition edges. In the Sapphire Transitions effects submenu. From: Optional. Starts the transition with this clip. To: Optional. Ends the transition with this clip. Wipe Amount: Default: 0, Range: -0.5 to 1.5. Determines the transition ratio between the From and To inputs, and would normally be animated from 0 to 1 to perform a complete transition. The curve controlling this parameter can be adjusted for more detailed control over the timing of the wipe. Wipe Direction: Popup menu, Default: Star In . The direction of the star wipe. Star In: the star contains the first image and shrinks inwards. Star Out: the star contains the second image and grows outwards. Edge Softness: Default: 0, Range: 0 or greater. Points: Integer, Default: 5, Range: 3 or greater. The number of points in the star. Pointiness: Default: 1.1, Range: 0 or greater. The pointiness of the star. Increase for sharp spikes, decrease for more regular polygonal shapes. The rotation angle of the star in counter-clockwise degrees. Rel Width: Default: 1, Range: 0.1 or greater. The relative horizontal size of the star. Increase for wider star, decrease for taller ones. The location of the star center in screen coordinates relative to the center of the frame. This parameter can be set by enabling and moving the Center Widget. Note that moving the star center can also cause the star size to change so that the current value of Wipe Amt remains correct. Border Width: Default: 0, Range: 0 or greater. Border Color: Default rgb: [0.75 0 0]. Border Opacity: Default: 1, Range: 0 to 1. Border Softness: Default: 0, Range: 0 or greater. Border Shift: Default: 0, Range: any. Show Angle: Check-box, Default: off. Turns on or off the screen user interface for adjusting the Angle parameter. Show Center: Check-box, Default: on. Turns on or off the screen user interface for adjusting the Center parameter. Show Glow Width: Check-box, Default: off. Turns on or off the screen user interface for adjusting the Glow Width parameter.